Quality kitchen cabinets can add grace and functionality to your kitchen, as well as enhance the value of your property. It could be quite an overwhelming task to select the right kitchen cabinets with the kind of choice available in styles, materials, designs and trends. Kitchen renovating is one of the best ways to give your home that makeover you always wanted. It is important to be neat and organized in the kitchen, and that is the primary purpose of kitchen cabinets. In terms of materials wood, steel, bamboo and plastic are quite popular for their sturdiness and looks. You also have the choice to pick a finish that matches the rest of your décor. Basically, you would have to consider the size of your kitchen and your maximum budget when it comes to getting kitchen cabinets, whether it is for a new kitchen or for a renovating project. Kitchen cabinets must take rough handling; yet meet your storage needs comfortably. That said, it is not very difficult to arrive at the most suitable choice even as you balance your budget with the style you want. It is best to keep your specific needs in mind when you go shopping. If new kitchen cabinets are not in the budget one alternative that can still transform your kitchen would be to resurface your kitchen cabinets. An important aspect of choosing your kitchen cabinet design is cabinet doors. Here the popular choice is maple wood closely followed by oak, cherry, hickory, pine and alder. Door style is important. You can look at flat, raised or curved; plain or carved. But this does not mean you must confine yourself to wood. You could also opt for polyester or plastic laminates that come in a variety of finishes. So, does steel and glass. As far as cabinetry finish goes, here also you have a choice of painted, glazed and natural finishes. While it is great to keep track of what the latest trends are, what perhaps looked fabulous on the cover of Good Housekeeping might not really suit your style. There are plenty of reputed kitchen cabinet manufacturers who will let you customize according to your needs. Therefore, browse around and go forth on your mission with confidence! There are a lot of magazines and illustrated design manuals online that feature a variety of kitchen cabinet styles and the appropriate materials for these. While you could easily visit a store and browse around, it is always better to browse online so that you can decide on the style that seems to appeal to you the most and can pursue the options available in that style. The slab door is a single door covering the kitchen cabinet’s front. This is a nice simplistic design with a clean smooth look. The raised panel door has a wooden frame that could be decorative in design. This style is good if your décor is formal. The recessed panel door has the panel behind the frame of the kitchen cabinet’s door. These are suitable for country style homes. There are doors that come with an arch at the top and suit most kitchen cabinets. When it comes to kitchen cabinet material the choice seems practically limitless. Your main decision would be from wood, metal or laminate. Wood looks great and can be in any colour or finish. Unfortunately, wood could warp over time. These days, however, this has been overcome. Metal kitchen cabinets are equally popular and look good in just about any kitchen. Stainless steel, though expensive, is easy to maintain. Laminate is a cost-effective option and is available in any colour. 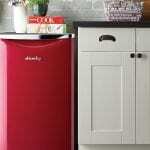 You can also use a combination of materials for your kitchen cabinets. In some sense, trend is what you make it because kitchen cabinets are a matter of personal preference. There are so many colour choices available today and people are no longer confined to plain whites. The new trend then, is more colours giving you the choice of matching it to the rest of your décor. Wood is also sometimes preferred. Functional designs move faster especially the storage type. Being organized has become a necessity. You can get pieces that can be retrofit into your existing cabinet if you are looking for a makeover. After you look at the choice available, you might like to mix and match and also keep the option to expand, open. People are opting for a kitchen cabinet design that will even include a work area, buffet storage, wine racks and a host of other accessories to make life easier. Kitchen cabinet design can be stock cabinets, frameless cabinets and personalized cabinets. Since your kitchen cabinet will take up the maximum space in your kitchen. Which design you choose depends on your budget, style, type of door, material you choose, the color and frames. If your budget does not stretch too much, refacing your kitchen cabinets can be more economical. With kitchen cabinets, quality counts. Being the area that sees the maximum traffic in your home, you want to ensure that your kitchen cabinets are sturdy and withstand rough use. As an investment that is quite substantial, you must get the right company to supply your cabinet. It is best to browse around and read ratings and reviews of various kitchen cabinet brands in the market so that you get the maximum out of your investment. Accessory shopping is always a pleasant task, particularly when you have a lot of choice, and it is no different with your kitchen cabinet hardware. Your kitchen cabinets become that much more attractive with the right choice of hardware. There are plenty of online stores that offer you a massive choice for different types, colours, shapes, styles and designs – that it can be quite mind-boggling to make the selection. Cabinet hardware in the form of handles, pulls and knobs are available in a variety of materials to suit any décor, whether it is traditional, trendy, classic or eclectic. You can look at pretty crystal, brushed nickel, hammered iron, polished chrome, rock, tile, cut glass, ceramic, brass, steel, silver – you name it and you have got it. The knobs and drawer pull add greatly to the décor and can come in many shapes and sizes. Choosing the right hardware can add the finishing touch to your kitchen. Often referred to as the jewellery that adorns your kitchen cabinets, your kitchen cabinet hardware in the form of pulls, knobs and handles don’t have to match perfectly. However, you can create a harmonious look that everyone will admire. Here are some tips. -Preferably, create a complementary look. This means a mixture of shiny/brushed brass, enamelled metal, nickel, steel – in the same kitchen can look jarring. Remember that your hardware might be visible from the room into which the kitchen leads. Thus, stick with a maximum of three colours. -Your kitchen cabinet hardware can create a completely customized kitchen. If you have got prefabricated cabinetry, then you can always replace the knobs and pulls with interesting hardware. Since quite a few tend to come with plain chrome, you can shop for interesting shapes and sizes that enhance the looks of your kitchen. While making your choice of hardware, the shape also matters since some can look and feel traditional while some are more modern. Many people transform their kitchen’s looks and give it a total makeover by simply replacing the existing hardware with something completely different. All you have to do is browse your local hardware store or online and order. For any homeowner, custom-made kitchen cabinets bring a great sense of excitement because with it, comes the freedom and flexibility to design it according to their needs. Kitchen cabinets are not just a place to keep your stuff; their design can influence the entire look of your kitchen. One thing is certain; for custom cabinetry, the choice is virtually limitless, and it is advisable to do some research so that you can plan what you want, whether you intend removing your old cabinets and getting new ones or setting up a whole new kitchen in a new home. Most people tend to believe that custom cabinetry is very expensive, but this is not necessarily true. Depending on what you want, a cost-effective material can be engineered to the required specifications so that you have a custom cabinet at probably half the cost of stock cabinets. The space available in the kitchen will determine the design and plan of your kitchen cabinets. Factor in space for other home appliances like refrigerator, cooking range, microwave, blender, and dishwasher, washing machine/dryer that will also be in the kitchen and plan your cabinets accordingly. When you go in for custom made cabinets, you can choose from hand-chosen wood, reclaimed wood, which is a more environmentally friendly option and rich woods like mahogany, oak, rosewood, etc. You can also get the cabinetmaker to reface or finish your existing cabinetry to give it a whole new look. Other options are fitting glass doors that are decorative, convenient corner cabinets, and drawers with gliders, etc. Kitchen cabinet design, in its most basic form is usually taken as a straight line along the longest wall to maximize space. There is also the L or U-shaped layout, but you will have to decide what is best based on your specific space. Preferably keep the refrigerator and cooking range far apart. If you intend including an island in your kitchen, plan the position of your kitchen cabinets accordingly. -Your kitchen layout – new cabinets or just renovate by replacing the doors for a new look. -Cabinet doors and drawers – do you want framed, panelled or plain? While decorative looks great, plain can also make a statement. 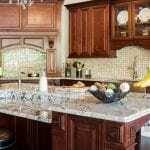 -Countertops – need to be coordinated with your cabinets for a harmonious look, so choose the complementary material with care. -Cabinet accessories – hardware makes a difference in the appearance of your cabinets and in ease of use. It is always advisable to get good quality hardware in the form of hinges, handles, pulls, knobs, etc. Check the quality of the material used to build your kitchen cabinets, depending on what you intend storing in the cabinets. In the long run, higher priced good quality is always better than short-term cheap material for your custom-made kitchen cabinets.